Zoey’s acting up and Dre and Bow seriously disagree on the best way to handle it! 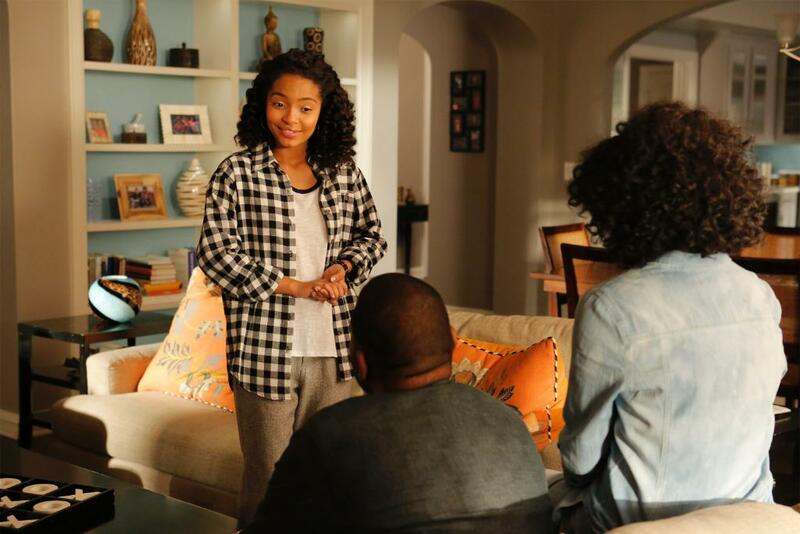 Watch a sneak peek of tonight’s black-ish “The Peer-ent Trap”, airing at 9:31pm ET|PT on ABC. In last week’s black-ish (“Switch Hitting“, Dre (Anthony Anderson) had his blackness challenged…and if that wasn’t bad enough, the fact that it was a white senior executive doubting his street cred really rankled. By now we know that Dre can be pretty extreme in his reactions, and this week was no different. Dre’s reaction? He invited Jay to his house for a home-cooked meal with his BLACK family. And certainly Dre could count on his family to come through from him with “Operation Keepin’ it Real”…right? Not so much! Bow (Tracee Ellis Ross) straightened her hair and cooked her version of soulfood—KALEard greens and vegan mac and cheese; Junior (Marcus Scribner) was dressed as his favorite Dungeon & Dragons wizard; Zoey (Yara Shahidi) wanted to go to a Jason Mraz concert (*SIDENOTE* LOVE Mraz…his live album from The Eagles Ballroom is everything! ); for their school projects, Diane (Marsai Martin) dressed up as her American hero Sarah Palin and Jack (Miles Brown) was the “godfather of hip-hop” Vanilla Ice; and Pops (Laurence Fishburne, nervous about an IRS audit) thought Jay was an undercover tax man, dressed in a suit, spoke British-english, and gave Jay an attache case of money for a bribe. Dre was distraught. But after a conversation with Pops about being proud of his son’s ability to move within the formal, corporate, Dre refused to let Jay (“White Cornell West”) make him feel ashamed of being a successful black man. Jay was impressed with Dre’s swagger and asked him to take on the Boxable account. Oh goodness! This is going to be a great one! Take a look at “The Peer-ent Trap” trailer below and remember to tune into ABC at 9:31pm ET|PT for the new black-ish and come live tweet with me while we watch!